Entry fees are non-refundable, non-transferable and non-deferrable. NOTE: While we do not expect many changes, if any changes at all, all details are subject to change. Final rules, courses, descriptions and awards will be published July, 2015. Saturday August 8, 5:00 p.m. to 6:00 p.m. The Pre-Race meeting is not mandatory, but is strongly encouraged for all Ultimate participants. If unable to attend the pre-race meeting, all kits for Ultimate, Sport, Relay and Guest runners can be picked up at the Stage at 7:00 am. If you are movtivated to run The ENDURrun to support a charity of personal significance, we would love to help. With a minimun pledge total of $1,000 to a registered charity of your choice, The ENDURrun will refund your entry fee. Download the form here. Welcome to the running challenge of a lifetime! This 160KM, 8 day, 7 Stage event will test your ability to draw deep into your reserves to pull out everything you're going to need. It's all about ENDURance. You could also use The ENDURrun as a training camp. Varying and challenging terrain. Attention to detail. Runner's needs. These are what we provide. You provide the endurance, the sweat, the motivation, the determination. Whether your goal is to win or simply to finish, we are here to help you achieve YOUR goal. The ENDURrun is brought to you by an experienced race committee with a long history of innovation, attention to detail and quality event organization. Join us in August 2015 for one incredible week. Compete with the best, or cheer on the rest. A celebration of excellence, a runner's dream. If you're ready for the challenge, The Ultimate is where it's at. If you can't make the whole week, the Sport offers a taste of everything. Looking to experience the event? 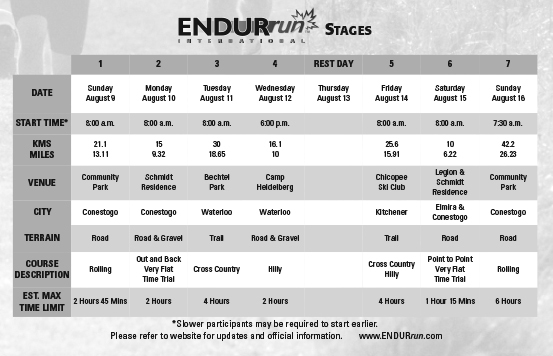 Running a single Stage, either as a Guest or a Relay member will give you a taste of The ENDURrun. 7 Stages to test your fitness, endurance, will, and yourself. 2014 Course maps and details can be found here. The 2015 booklet will be published soon (no major changes expected). PRIZE MONEY (All prize money is in Canadian $). There is a total of $3,500 in potential prize money to be awarded. GOLD JERSEYS The Male and Female cumulative time leaders after each Stage will have the honour of wearing the GOLD jerseys for the following Stage. TROPHIES The overall Male and Female winners will have their names engraved on The ENDURrun Trophy. The Rookie (1st time participant) Male and Female winners will have their names engraved on The ENDURrun Trophy. "The toughest and most rewarding eight days of my life." 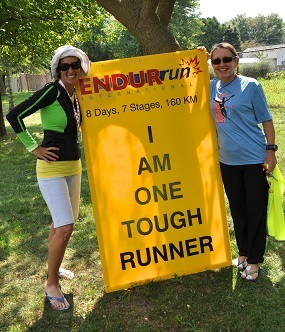 "If you've ever wondered what you're capable of, run The ENDURrun!" "The ENDURrun event may only last for 8 days, but the experience and friendships last a lifetime." "The ENDURrun is, by far, the best running experience of my life. The competition, the camaraderie, the support of the volunteers and the carefully planned Stages make it the pinnacle of my racing calendar each year." August 16 12:00 PM EDT - Awards (we strongly encourage you to arrange your travel plans to allow you to participate).